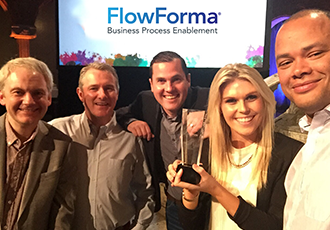 FlowForma, an Irish start-up that has only been trading as a standalone company for six weeks, scooped a prestigious industry award in Sweden in November, winning 'Best Office 365 App' at the European SharePoint Community 2015 Awards ceremony. "Winning the award tops an extraordinary two years for us. It's testament to a great team that we have gone from incubation mode to successful software exporter with customers in Europe and the US in such a short period of time." Exports currently account for 25 per cent of FlowForma business, a figure Young expects to grow to 75 per cent within three years, thanks to support from Enterprise Ireland. The solution is now used by over 50 customers and has seen great traction in the Healthcare, Life Sciences, Fast Moving Consumer Goods and Professional Services sectors. FlowForma sits on the Microsoft SharePoint platform and allows business analysts and consultants to build out their own processes, rather than rely on software developers. Seamlessly integrating people and processes with custom workflows, it continues to evolve with a mobile app just added to its feature set. SharePoint is now the collaboration platform of choice for 75,000 companies worldwide and over 160 million users. The European SharePoint Awards recognizes organisations that have showcased the very best SharePoint or Office 365 solutions, projects, strategy or innovation. FlowForma started life as a division inside Ergo, the IT services firm, and was spun out as separate entity to meet the growing demands of early-win customers that included NHS hospitals in the UK. It now employs 30 people. In July this year, another Ergo spin-out, Fenergo, announced $75 million in investment from New York-based private equity firm Insight Venture Partners.